Leaving Manhattan: the last days of Jean-Michel Basquiat – Life moves pretty fast. Certainly he was leaving Manhattan. Almost certainly he was, at the age of twenty-seven, giving up the mercantile and treacherous art world. Perhaps he would be a writer. Perhaps he would take what he called an “honest job,” like running a tequila business in Hawaii. The following Thursday, he was leaving for the Ivory Coast, where he was expected in a Senoufo village five hundred miles inland from the capital, Abidjan. Here he would take a tribal cure for the heroin— and other New York wounds. That agonizing present tense, when the fact of death hasn’t quite sunk in. 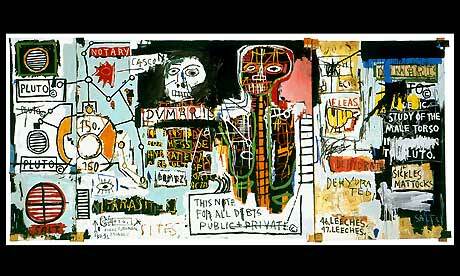 Bray passed the note to Basquiat, but he was too loaded to focus, so Bray read it aloud, and left, fuming. “Somebody who gets that high is dying over and over and over again,” he says now.